Purchase Hesch Institute physical therapy products and Jerry Hesch, MHS, PT related material such as The Dynamic Body by Eric Dalton. 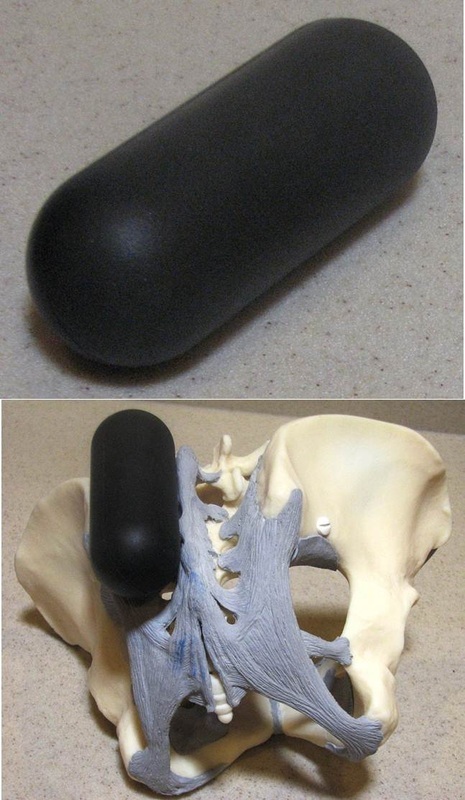 In addition, visitors to the Hesch Institute Store may purchase foam mobilization rolls as well as anatomical models like a large flexible pelvis or a small plastic sacrum. Hesch Seminar courses and Hesch Method videos. A unique Hesch Institute product. This anatomical model is life-sized. 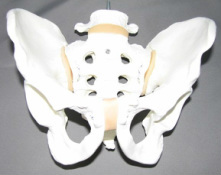 The symphysis pubis, sacroiliac joints, and L5-S1 joints are mobile, similar to living anatomy. Ideal for demonstration of lumbo-sacral and pelvic joint motion and dysfunction. Comes with display hanger loop (hanger/stand sold separately). 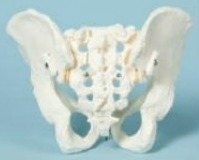 The Small plastic sacrum is ideal for practicing or demonstrating sacral torsions and other sacral movement dysfunctions. It's also ideal for carrying in a lab coat or pocket. It's detailed and durable. Can be attached to a keychain. Made in the USA. Practice tool for developing the skill of Hesch Springing with AwarenessTM. 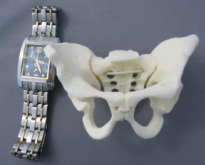 Molded to fit the hand comfortably, it mimics normal load (taking up the slack), and spring and recoil for testing passive accessory motion in the pelvis and large bony landmarks throughout the body. Loads at about 15-18lbs psi then springs at 30-32lbs psi, the same as the pelvic joints, allowing the practitioner to quickly develop comfort and skill in performing Hesch Springing with AwarenessTM. Designed by Hesch Institute, the vertical SI support is designed to enhance vertical stability and support the vertical SI ligaments, unlike any other sacroiliac support. Vertical instabilities can be subtle and often times missed by clinicians. Guess work is taken out because the client will feel immediate relief when vertical support is applied in the presence of vertical instability. Made of durable comfortable webbing with Synthetic lambs wool comfort pads for shoulder and ischial tuberosity. SOFT - 1-1/2" diameter roll in 4-1/2" length. 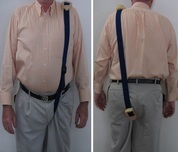 Ideal for small frame individuals of less than 120lbs. Especially ideal for patients in acute pain who tolerate only mild pressure, such as clients with fibromyalgia, etc. Loads slowly over 5 seconds to bottom out at a comfortable 50% height at 15# psi. Can be used in other parts of the body, such as trigger points, and for gentle soft tissue release. By using less pressure the clients tolerate the foam roll for a longer period of time, making for effective and long-lasting benefit. The rubber foam has similar viscoelastic properties to muscle, fascia, and soft connective tissues. It's a soft foam much like what is used in stress balls. FIRM - 1-1/4" diameter roll in 4-1/4" length. Made with 1/2" medium density foam with center hardwood dowel, plasti-dipped 4 times for long lasting durability and ease of cleaning. Deforms only slightly and quickly to a firm body-foam interface. Comfortable for those of medium to large body type (average weight over 120 lbs). Tolerated well by those with sub-acute, or milder pain. 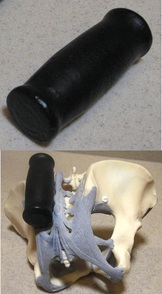 The combination of the rubber foam and center wooden dowel has similar viscoelastic properties to muscle, fascia, denser connective tissues, and joints. This roll is ideal for restoring anterior glide to the Trochanter to treat piriformis syndrome and other hip rotators that can perpetuate piriformis syndrome, and for pelvic Flare Exercises. 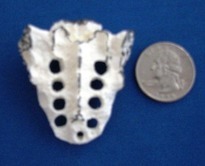 It is also ideal for myofacial release and trigger point release to the spine and extremities. It is a high density, long lasting foam. It deforms about 10% to maximize comfort. Tolerated well by most body types. Ideal for stretching the spine, especially the thoracic spine & rib cage. Optimal for balance and coordination, pilates & yoga stretches and exercises. It is also ideal for myofacial release and trigger point release to the spine and extremities. It is a high density, long lasting foam. It deforms about 10% to maximize comfort. Tolerated well by most body types.